After eleven hours of heat, cold, snow and wind, Raúl Martínez and Carlos Pauner have reached 6450 metres where CII is installed. After comparing his strength, Adrián Uclés at CI decided to go back to the Base Camp. A difficult decision… but the best one without a doubt. Over time, when the state of normoxia stabilises in his head and his body is well fed and hydrated, he will ask himself “and…….what if I had kept going a little longer? Adrián, it’s no cliché to say that only good mountaineers are capable of reaching these conclusions. For a mountaineer, abandoning is a strength, a virtue and under no circumstances a weakness. You’re a very strong guy, decided, jovial and happy, confident. I imagine the turning point and see your eyes looking up, with your legs bent and a look of reflection, your voice saying what you don’t want to say and the surprised, accomplice look of Raúl and Carlos. On your descent to the Base Camp, you will have looked just once at your colleagues as they walk away, with the iciest peak of the GII in the background and then putting all of your attention into the arduous descent, full of cracks. Adri, you’re an admirable man, you have caressed the eight-thousander, a discipline not within reach of us all but only the privileged few, of which you are one. You have gone with your homework done to get a good grade but, on analysing the circumstances, has decided to bid your farewells. Here at home we give you a knowing wink, a hug, and thank you from the bottom of our hearts that you’re one of us. Adri, we’re really proud of you. Insofar as Raúl and Carlos, they were very tired but animated. Their plan is to reach the CIII tomorrow; they’re 700 metres away, and then the summit on Friday. An ambitious, demanding plan that we hope goes according as expected. They’re about to show their cards, big style, and we hope they’ve got the best hand. They won’t get another chance, bad weather is on its way and their stay on the Karakorum will be over. The alarm clock went off at three a.m. at the start of what has been a long day. As forecast, it was snowing. At four a.m., after a light breakfast because you’re not at all hungry at that time, the entire group started the climb C1. After ten minutes, Gonzalo decided to turn back, not feeling strong enough to continue. Raúl, Carlos and Adrián carried on, battling against the snow, and after eight long hours reached C1. They have set up their tents and plan to spend the night there. The route from the BC to C1 runs along a glacier full of cracks. The falling snow is not great for vision and covers all of the cracks, making them death traps for mountaineers. 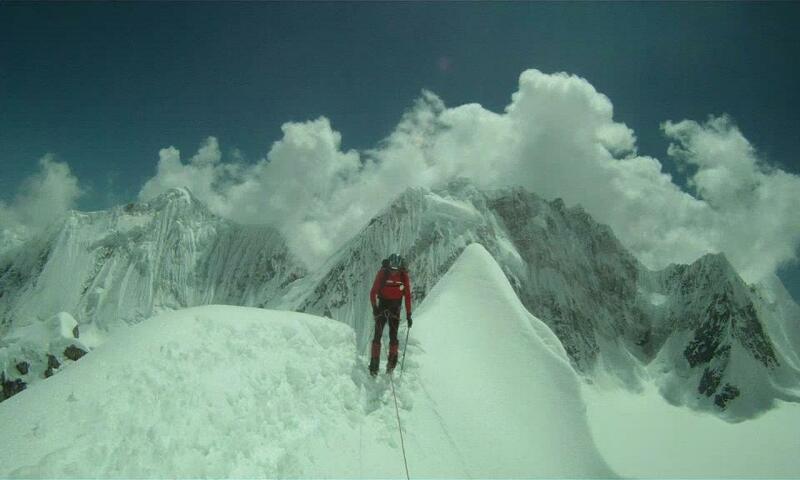 Extra effort is therefore required, overcoming the altitude and being extremely careful to avoid the hidden cracks. Raúl’s voice was as calm as usual, that’s the best message. They have the usual altitude problems but are optimistic and physically in shape. The three will spend the night in a small tent. They were just melting snow for water and preparing a tasty dinner that is typical at altitudes: soup with pasta. Over a very faint phone line due to bad coverage, possibly because of the bad weather in the area, we were informed of the situation of the Aragonese mountaineers. They have reached the Base Camp after completing what some call the prettiest trekking trail in the world. Behind them are emblematic masses such as Trango Tower, Chogolisa, Masembrum, K2 and Broad Peak, among others.